I suddenly realised today how close we are to the end of March – hasn’t time flown? It only seems yesterday that we were celebrating the New Year, and we are now celebrating the appearance (probably) of Spring. I love the flowers which are now starting to appear – the daffodils in full bloom, then we have the Bluebells to look forward to. We have loads of bluebells covering the gardens around here, and a carpet of blue is definitely something worth seeing. For this card, I have used inspiration from the Altenew challenge for March with the gorgeous inspiration photo full of colour, the Simon Says Stamp Wednesday Challenge of ‘Anything Goes’, and Make My Monday Challenge with the theme of ‘white embossing’. 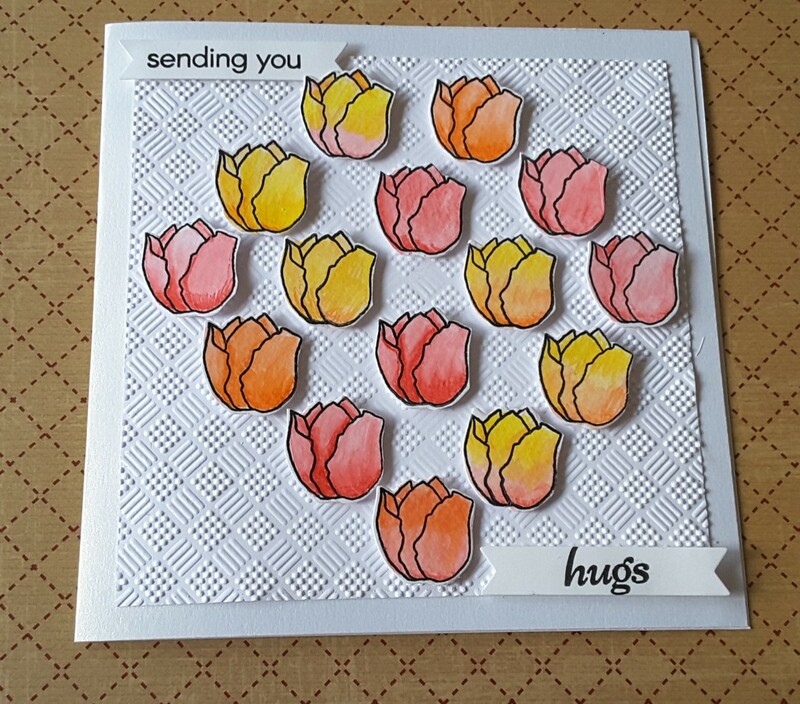 When I looked at the inspiration photo, I thought of my Tulip stamp and die set, but I didn’t quite know where I was going with it. I stamped approximately 16 full tulip heads in black Versafine, and embossed with clear embossing powder. I didn’t want a thick outer line, which is why I used the Versafine, but just something to outline the flowers and differentiate them from the background. I also stamped and embossed the stems, all of the variety in the stamp set, just in case I wanted them. I wanted to water-colour again, so took my Derwent Inktense pencils and had a play. I did some flowers all in one colour, then added a darker colour, merging the colours together. I know that tulips are usually a single colour, but my variety of tulips are a mixture of two, if not three colours! I used the three coloured pencils in the photo above – Tangerine, Sun Yellow, and Poppy Red. The pencils certainly do pack a whole load of ink and I really, really enjoyed playing with them. I then cut out the whole bunch of flower heads with the matching die set. I must admit, it took a bit of manoeuvring to get the dies to sit just right around the flower heads – some cut off to one side, but I think I finally got the hang of it. Once I had the flower heads and stems, I started with put them onto a 7 inch square card base. I started laying the flowers down, added the stems, removed the stems, re-arranged the flowers – this process took me approximately 20 minutes, until I was happy. I decided not to use the stems, and arranged the flowers into a shape which slightly resembles a heart. Can you see it? Is it just my imagination? For the background, I wanted to add some interest, so used my Sue Wilson A4 embossing folder ‘Checkboard’. This is a dimensional embossing folder, called a ‘PinPoint’ embossing folder, and gives an impression of a trellis. I know that tulips don’t climb trellis’s – but artistic license is certainly used whilst making this card. I embossed white card, and added straight to the card base, re-arranging my flowers yet again, and sticking them down using foam pads. Now for the sentiment. I didn’t have a whole row to place a long sentiment, so used two of the ones provided in the tulip stamp set, and cut them out with my Stampin Up ‘Bunch of Banners’ framelits, putting one on the top left, and the other part on the bottom right. That way I thought the eye would be drawn across the whole card. Quite a simple card, but it took a lot of fiddling around – colouring, die cutting, arranging. All good fun. This is a really beautiful card. I love the colours. Thank you for joining us at Make My Monday (and sorry for the late comment – I have been away). Sian. Thank you Sian. No problem re: lateness. I just appreciate your comment. Wow beautiful watercoloring! Need to practice so mine looks this good. So glad you played with our challenge at MMM. Thank you, Robbie. I enjoyed the challenge.